Fool For Love... Simple, Good and Tasty goes to the Movies, Part 2. This is part 2 in a series about running a craft services table for a film shoot here in Minneapolis for the Independent movie Stay Then Go. Read part 1 here. It's been a long time since I've done anything more than plan a dinner party for four. Hell, it's been a long time since I've even done that. Maybe 20 years. Most of my cooking now revolves around the challenges of cooking for just one, such as how to make the most of vegetables before they go bad in the bin. Now, suddenly, I've elected to undertake a project that is a whole different kettle of fish, so to speak. Those following this story know that as part and parcel of taking on the task of providing "Craft Services" to the film production crew of Stay Then Go, I've basically signed on to a catering gig for 60+ adults, five days a week, for an estimated 15-16 hours a day. And I'm going to blog about it, detailing the experience and writing about the wonderful retailers and restaurants, friends and neighbors who are going to help me create a Simple, Good and Tasty craft service table -- Minnesota style. What was I thinking? As we moved through pre-production and into the early days of filming, every day brings a new anxiety, a new set of seemingly intractable complexities. The thought and care that goes into creating a little ephemeral world for a period of three-to-six weeks is jaw-dropping. These are 60 very smart, ambitious, hard working people who do not suffer fools gladly. Furthermore, they have to shoot the raw material to make a movie in 15 days, roughly half the time that a commercial film takes. And they have to do it by begging, borrowing and stealing. For most of the cast and crew, a film shoot is not glamorous work. It's physically grueling. People are hot and thirsty and hungry. As an independent film, not bankrolled or driven by large commercial investors and concerns, the budget for food is almost nil. Looking back on it, I should have stopped and taken a breath when Christine Walker looked surprised when I said I'd be willing to staff the craft service table for Stay Then Go, all for the opportunity to see how filmmaking gets done. I should have looked at the fine print when she quickly said, "You will?! Great!" But the archetypal Fool, the one hungry for adventure and learning and willing to walk, happily off a cliff (or simply blissfully unaware of being on the precipice) dominated any all other energies and impulses. The joy in the journey has been in getting the opportunity to explore and learn about some of the wonderful opportunities available in the local food scene and connect with folks around art and the community -- both passions of mine. The only unfortunate part is that there isn't sufficient time to explore all the opportunities for epicurean delight and community building that are available in this food-rich metropolis. Ideas for great prospects to participate in the Simple, Good and Tasty craft were easy, but there was simply not sufficient time, with two weeks before filming, to fully capitalize on the notion of providing a craft service table with a local flavor. Still, I was overwhelmed by the largess of some extraordinary restaurants, cooks and friends. In the end, I was able to connect with some wonderful representatives of our local food scene: the iconic Hell's Kitchen, the sultry and savory Gorkha Palace, the extraordinary Mojo Monkey, which takes donut making to the level of high art, Clancy's Meats (need we say more about them?!) and a woman I consider both a friend and food mentor, Cynthia Olson of Never Enough Thyme catering. Incredibly generous contributions by two of my favorite beverage makers -- La Croix and Peace Coffee -- and a shopping card from Seward Co-op were overwhelming by virtue of their quality and the enormous value they bring to the set every day. Finally, friends have been willing to lend a hand and open their gardens and kitchens to me. I'll be detailing my experiences throughout the process. If I'm a fool, about to walk off a cliff, so be it. I'm a fool for love. 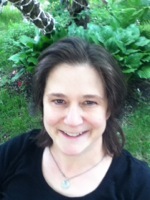 Denise Kulawik is a freelance writer now residing in Minneapolis, Minnesota. In addition to her work for Simple, Good and Tasty, her work has been published in the Boston Globe, The Arlington Advocate and The Journal of Healthcare Philanthropy. Ms. Kulawik's original screenplay, Music Lessons, is currently in development with New Globe films. Her last article for SGT was: Eating to Love: The Pause that Refreshes.